Ah fall. 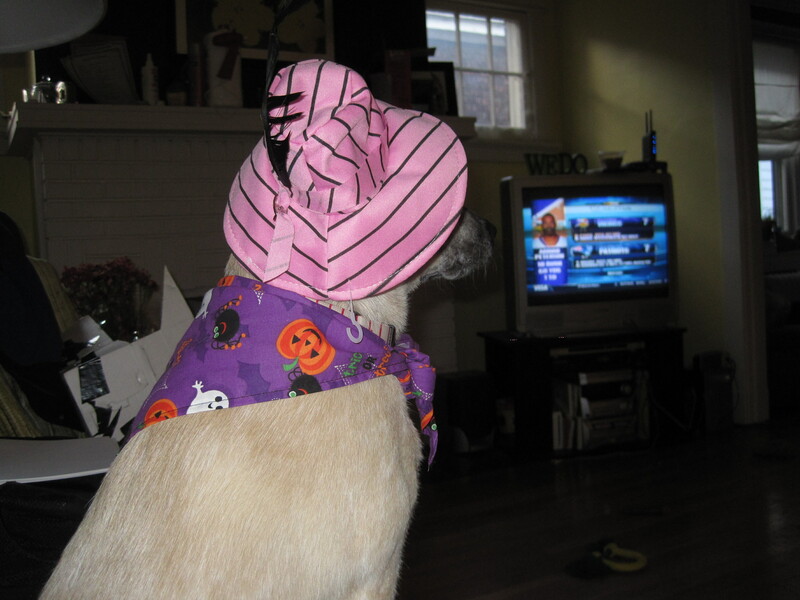 Pumpkins are plentiful, the air is crisp, and my puppy needs to put every leaf that fell off a trees into her mouth. I had seen these brain cupcakes for Halloween on a program on the Food Network (http://www.shescribes.com/2010/10/red-velvet-brain-cupcakes-from-food-networks-anne-thornton.html) and I wanted to find some excuse to make it because how often do you get to play the zombie card? I altered the original recipe in a few ways. First, I wanted to make pumpkin cupcakes instead of red velvet cause I might as well get my pumpkin fix while I still can. The other alteration was due to the high quality supermarket I was dealing with. This supermarket didn’t carry canned pumpkin. The only thing I could get was pumpkin pie mix. Now this made it “fun” because I had to try to come up with a recipe on the fly since there was “sugar and spices” in this pumpkin pie mix (way to be specific ingredients!). The outcome was pretty good but it could afford to be a bit sweeter. Also the frosting got a little too purple; apparently cream cheese frosting takes coloring very well. The whole “brain” theme kind of went out the window also. I didn’t have piping bags so I tried to use a Ziploc bag with a decorating tip. I caused 3 bags to explode as a result. 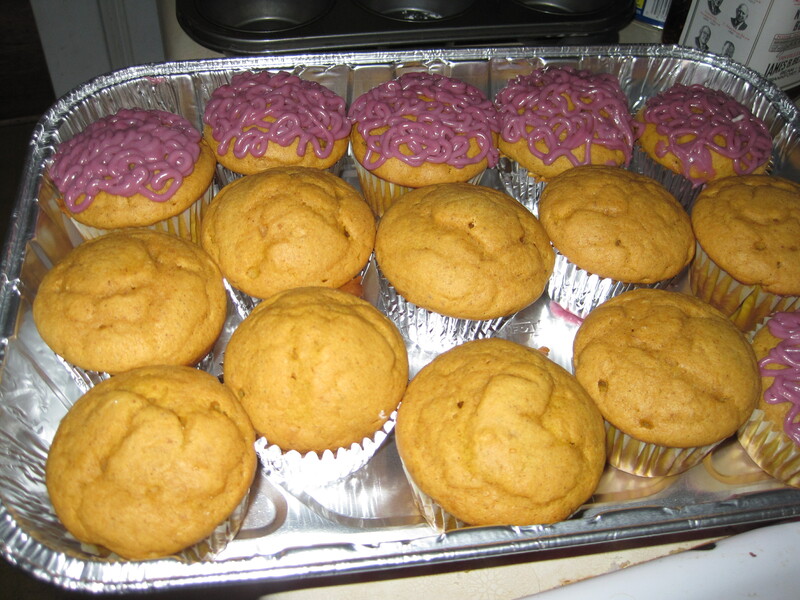 So it became more 1/4 brain cupcakes and 3/4 pumpkin cupcakes with purple frosting (still festive, right?). A lot of this is rough since I had to kind of mix and match everything. Enjoy! Sift together the flour, baking powder, baking soda, salt, ginger, cinnamon, and nutmeg into a bowl. Mix butter and sugar until light and fluffy; beat in eggs. Blend in pumpkin pie mix. Stir in the sifted dry ingredients alternately with the milk, blending until batter is smooth after each addition. Spoon batter into well-greased and floured or paper-lined muffin pan cups. Fill about 2/3 full. Bake at 375° for 25 minutes, or until a wooden pick or cake tester inserted in center comes out clean. Makes about 20-24 cupcakes. Place cream cheese in a medium mixing bowl. Using a rubber spatula, soften cream cheese. Gradually add butter, and continue beating (I used a hand mixer) until smooth and well blended. Sift in confectioners’ sugar, and continue beating until smooth. Add more (less) sugar if you would like a more (less) runny frosting. Add vanilla, and stir to combine. 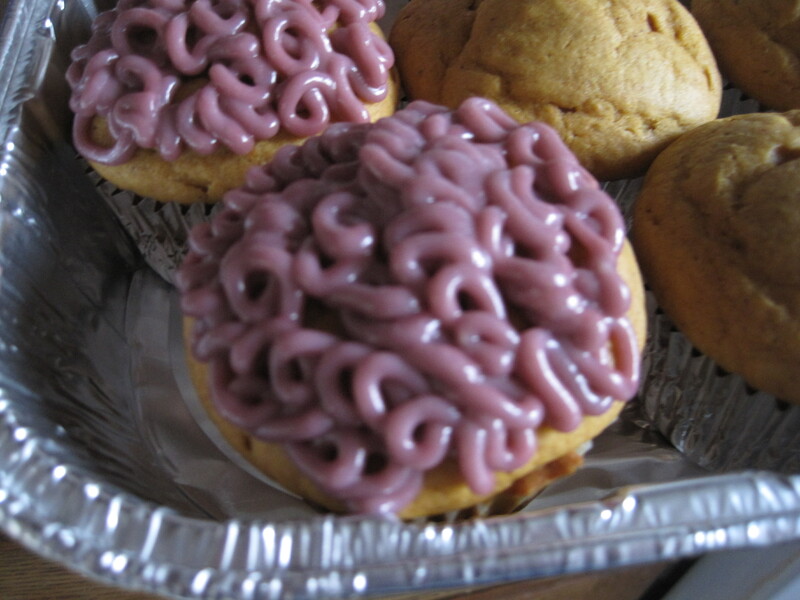 To get the “brains” look use a pastry bag and a large round tip. Fill the pastry bag half full with the frosting, and pipe out into a squiggly pile on half of each cupcake top, next pipe the frosting in a squiggly pile on the other half of the cupcake top, making 2 brain hemispheres.